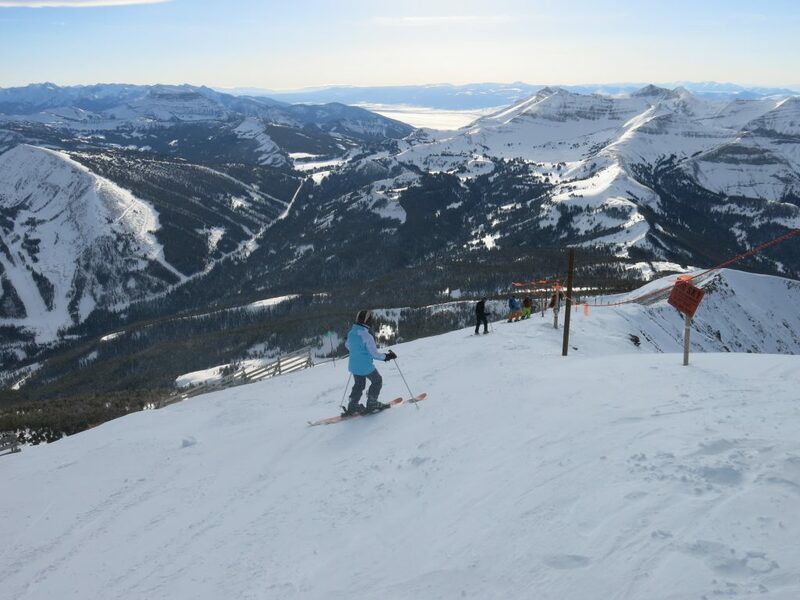 Big Sky is the most popular ski resort in Montana, and one of the largest in the U.S. Near Bozeman, it attracts visitors from all over the world looking for colder snow and a spectacular landscape. * Sigh * This is a tough one. 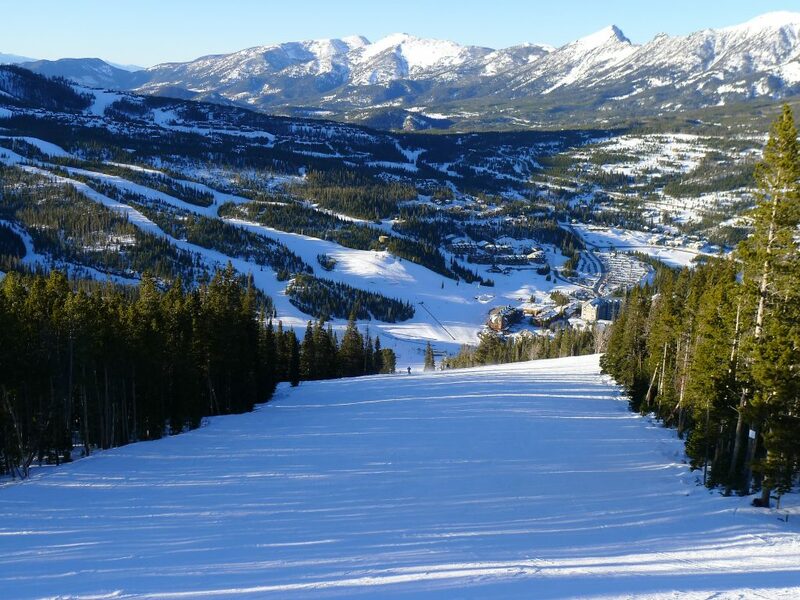 I expect that the vast majority of people who visit Big Sky really love it. 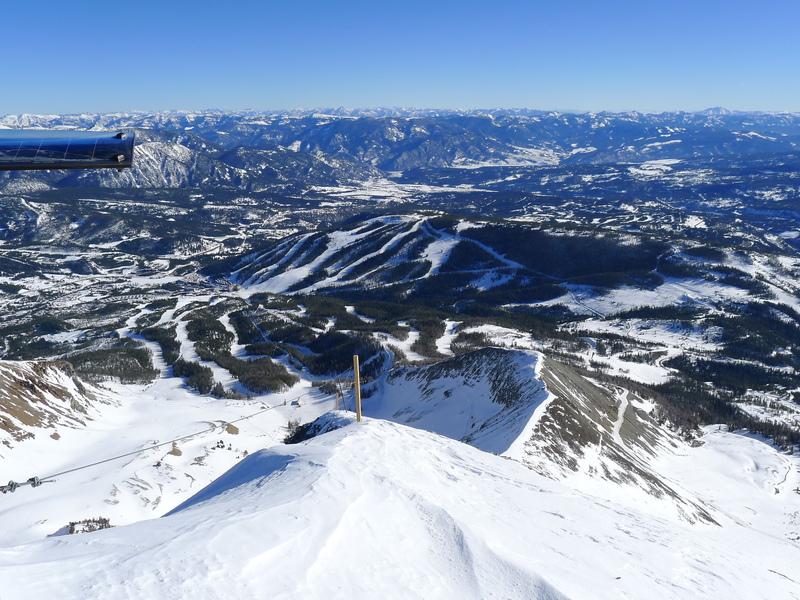 Based on comments we heard on the lifts many people consider it the best skiing in North America. On paper it has everything that you could ever want in a ski resort — huge acreage, huge vertical, lots of snow, no rain, and 34 lifts (although there are just 20 lifts that serve skiing pods). The problem is that for whatever reason the 4 days over 2 trips haven’t been as much fun as they should have been. First off is the rocks. For a place that seems to legitimately get 400-inches of snowfall, it doesn’t show. On both trips my skis became intimately familiar with new rocks on just about every other run. The run down from the top of the tram in December 2017 featured about 300-vertical of sideslipping over rocks to get to the skiable part. Notice the narrow strip of snow behind the orange sign in the photo below which was the main path down. Now imagine 50 mph gusts of wind and look at the steep dropoff you are on the edge of. Next is the crowds. Yes, it’s popular but with 20+ lifts you would think it would handle the crowds well. Sadly this is not the case. Searching for a place to sit down to eat was an exercise in frustration. Many of the lifts are short or flat so the good terrain always had lines. The tram was a 30+ minute wait on both trips. So yeah, we didn’t really like it that much and probably won’t go back any time soon, but I understand why it’s popular and for less picky skiers it’s probably fantastic. 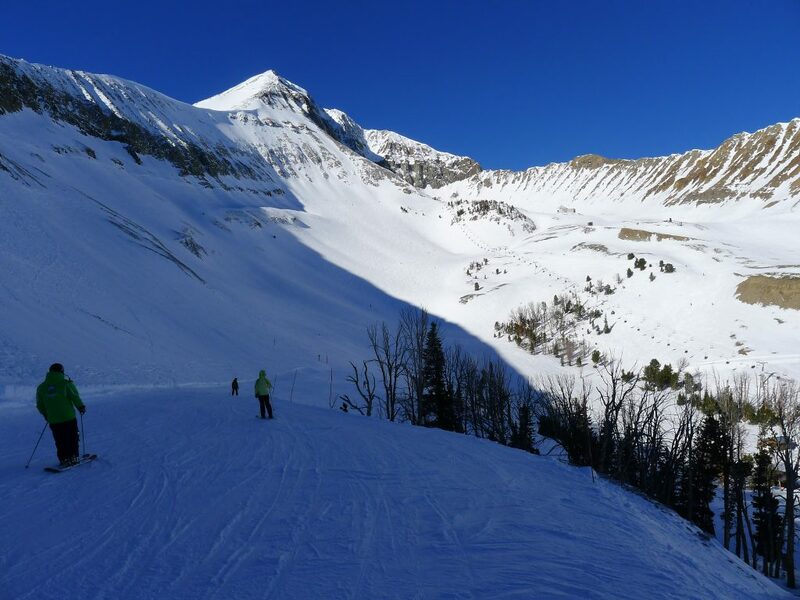 I’ve skied just about every area of Big Sky over the 2 trips but I’m only going to cover the places that were good. First up, the Big Sky village side has 2 ski pods on Andesite mountain that are really nice: Ramcharger and Thunder Wolf. 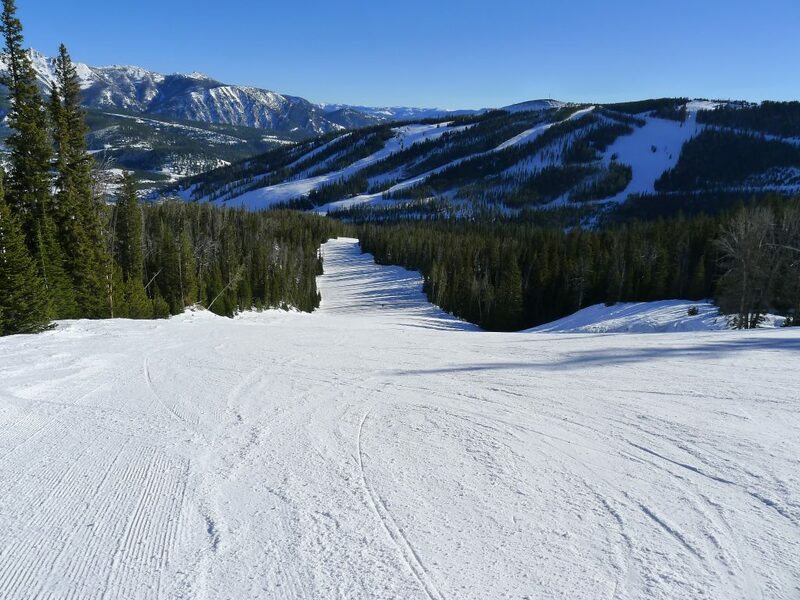 We hit exceptionally good snow in December 2017 and had our best runs on Ramcharger the first day with 16″ of fresh snow. 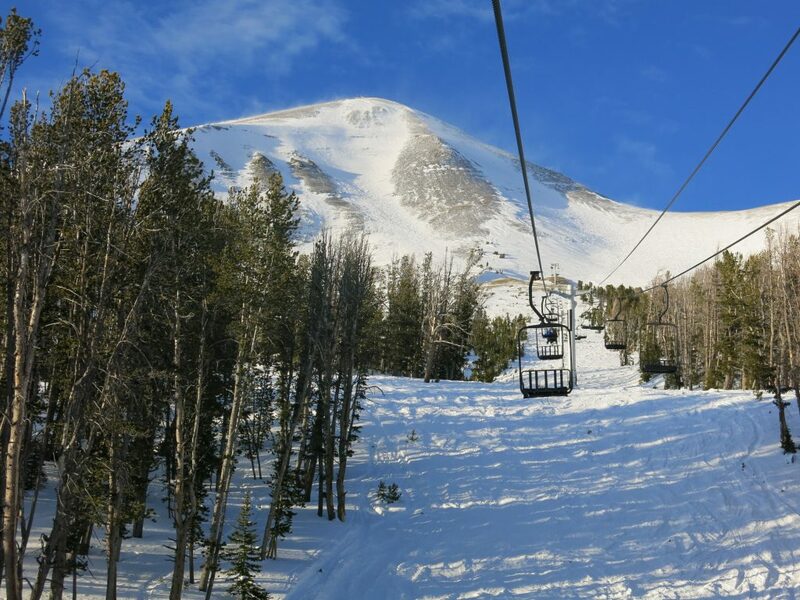 Ramcharger was replaced with the first high-speed 8-person chair in North America in the summer of 2018, which should help with the long lines there, but the tradeoff will be a LOT of people skiing that pod. The Challenger triple was just recently replaced when we were there, and it was our favorite chair overall. 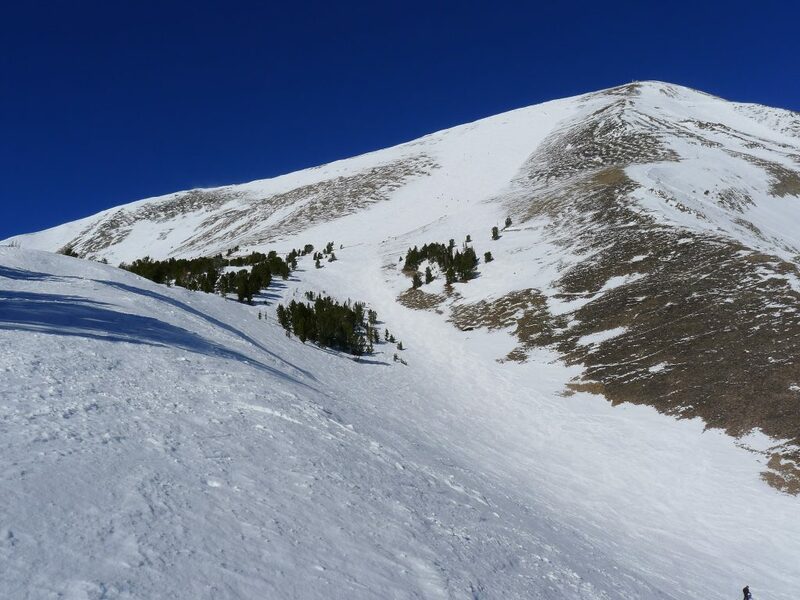 There was snow constantly blowing into the bowl, producing chalky steep skiing that was as smooth as a billiard table. Awesome. Powder Seeker is the 6-pack in the main bowl and that is some great terrain even though the vertical is not that much. The new chair is a vast improvement over the old slow chair and lines were very short there. The six-shooter lift on the old Moonlight basin side is LONG and fairly interesting, although it is pretty flat in sections and there were a LOT of rocks on the latest trip. 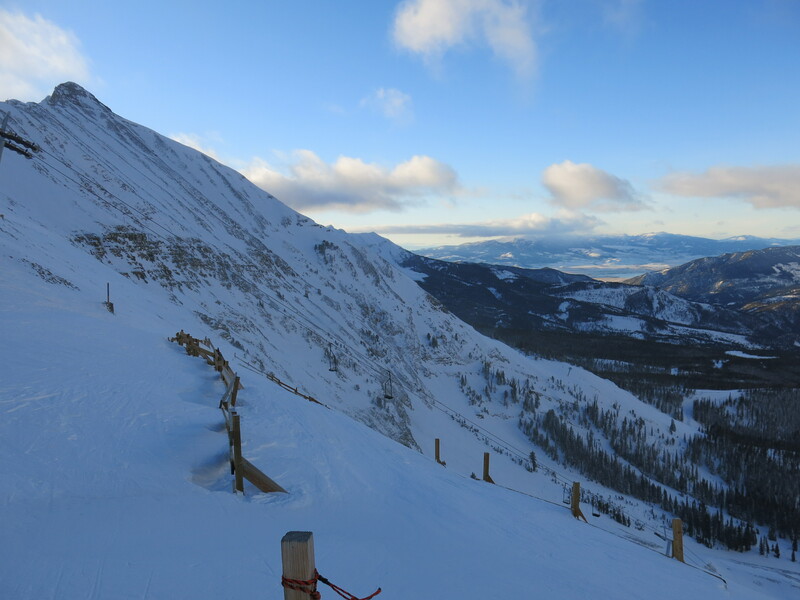 The entire south-face side is great but hard to get to, and it’s impossible to lap the main course which is Liberty bowl from the top because it takes multiple lifts and a long wait on the tram to get back up there. For that reason it’s more of a once-a-day treat, and in 4 days of skiing there I never really had time to ski Dakota once I got over there. Shedhorn is very rocky at the top and remember that all this terrain faces south so corns or ices up quickly. The restaurant and base-lodge situation at Big Sky is simply unacceptable. The cafeteria is way too small for the number of people trying to get food. On both trips people were sitting on the floor, and there was a lot of anger in the food line because it was not moving. We gave up and got whatever we could find at Starbucks and the general store. The good news is that this should all be changing because they are apparently pumping in another $150 million in improvements and I have to believe some of that is going to go toward on-mountain food service. $129 lift tickets hurt. We never could find discounts on either trip. We won’t be going back any time soon, but don’t let that stop you! 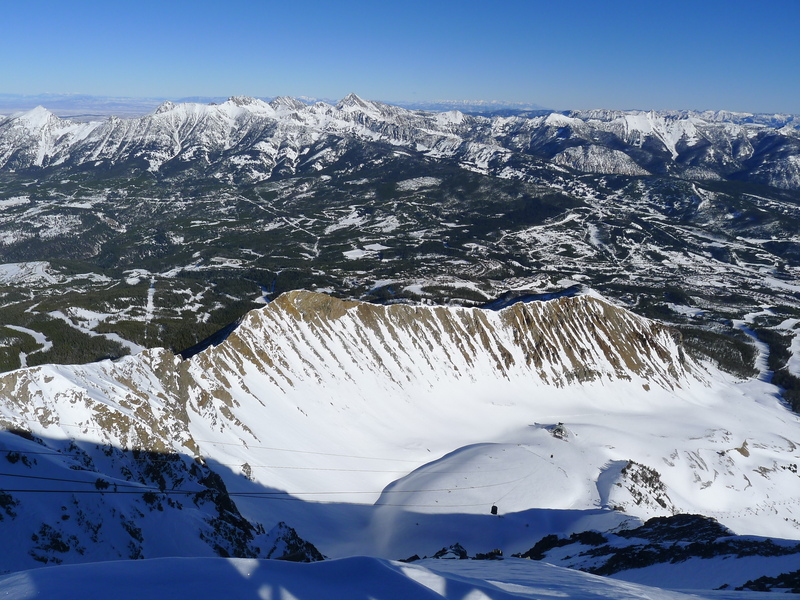 It’s a spectacular place and most well-travelled skiers should go check it out. Hopefully they can address some of the problem areas in the next few years of improvements.